In addition to $ trillion+ war, we’ve spent $113 billion rebuilding Afghan… that’s 2x our own $50 billion annual federal highway spending! US taxpayer dollars go to a hydroelectric dam in Afghanistan that provides 30% of its power to the Taliban. What’s the goal in Afghanistan? USA spent $8billion to eradicate poppy in Afghanistan and they doubled annual production of poppy (opium). What’s wrong with this picture? The European Semester for 2017 ended officially at the end of June, when the leaders of member states adopted the Commission’s country-specific recommendations. What are the lessons of this year’s exercise? The semester was created at the peak of the financial and economic crisis to track countries where economic problems are building up so that there can be a reaction before it is too late. Right from the start, the reaction was set up to be a weak one – the European Commission carries out in-depth analyses of countries whose economies raise concerns and then makes country-specific recommendations. Over the years, there has been poor and incomplete implementation of those recommendations. That is why the EC made some adjustments, but the situation only looks different. The European economy is performing very well and last year the EU and euro area economies grew by almost 2%. Employment reached its highest level so far – 232.9 million people. Budget deficits are dropping, government debt too. However, there are still serious problems that hinder economic development. Some of them are a legacy of the crisis, such as social inequality and the divergence of economic development among member states, and others are the result of low productivity. This is also the direction of most individual recommendations to member states. The main conclusion of the EC about the overall functioning of the European Semester is that the implementation of recommendations takes time. 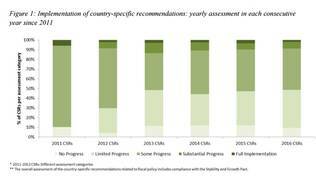 Progress on the implementation of recommendations from previous years is significantly higher than that of the most recent ones. This, according to the Commission, means that it is important to make an assessment of the medium term as well, rather than just looking at year-on-year performance. 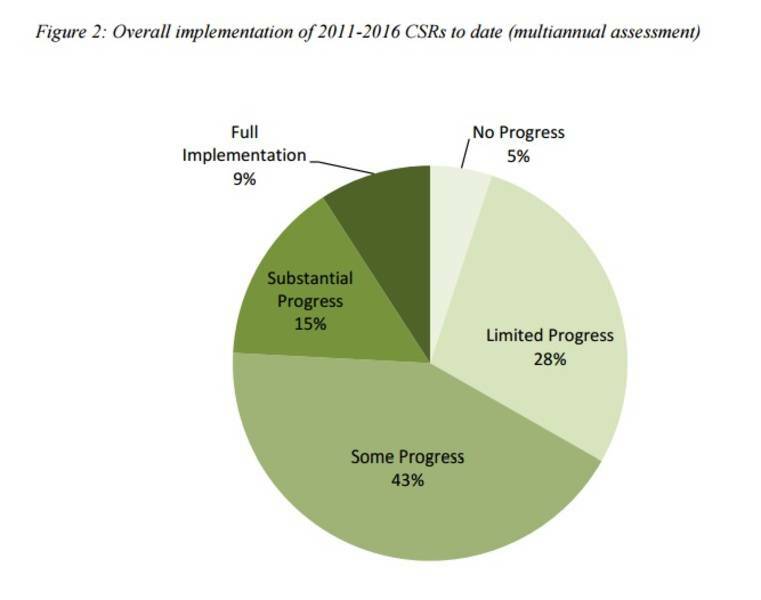 For example, two-thirds of the 2016 recommendations have a “some progress” status, which is an euphemism of almost no implementation. Since the beginning of the European Semester in 2011, the pace of progress, estimated year-on-year, has declined steadily. The EC explains this with the political sensitivity of the reforms. The easier ones are done first. This trend, however, has begun to reverse last year, the Commission believes. The greatest progress has been made in the area of fiscal policy and governance, and in financial services. Serious measures have been taken in many countries to improve the sustainability of pension systems. The slowest progress is on health care reforms, the expansion of tax base, improving the business environment, access to financing, and competition in the service sector. According to the EC, although these reforms have a long-term horizon, they will become more and more urgent because of the increasing demographic challenges. This year, the EC diagnosed 12 countries with macroeconomic imbalances, and 13 got full in-depth reviews. Currently, six countries have the mildest form of macroeconomic imbalances – Germany, Ireland, Spain, The Netherlands, Slovenia and Sweden. Other six have a more severe diagnosis – excessive imbalances. These are Bulgaria, France, Croatia, Italy, Cyprus, and Portugal. Cyprus, Italy and Portugal have undergone additional reviews, but the Commission has concluded that there is no need to increase the level of imbalances for them. Labour market reforms have been implemented in many countries and some have already shown results. Still, youth and long-term unemployment remain priorities for Belgium, Bulgaria, Ireland, Italy, Lithuania, Hungary, Portugal and Romania, which are expected to work towards eliminating labour market segmentation. Bulgaria, Lithuania and Spain are also expected to work harder on their social policies. In some countries, labour market problems are linked to the participation of certain population groups. Gender gaps in employment and wages are still significant. In some countries, integration of migrants into the labour market needs to be improved – Belgium, France, The Netherlands, Austria and Finland. Progress in Germany, Croatia, Luxembourg, Austria, Poland and Slovenia is limited in terms of supporting older people to participate in the labour market, which requires a mix of reforms of pension systems, the labour market, lifelong learning, and healthcare. The latter has been identified as a serious problem in Latvia, Austria and Romania, which suffer constant underfunding of their health systems, excessive reliance on hospital care, huge extra payments and staff shortages. This year, the EC made recommendations for education reforms, especially towards improving skills to Austria, Belgium, Bulgaria, Spain, France, Lithuania, Cyprus, Croatia, Hungary, Austria, Romania, Slovakia and the United Kingdom. Another major problem, highlighted repeatedly by European Central Bank President Mario Draghi, is the large accumulation of non-performing loans. This is currently one of the priorities of EU finance ministers. Bulgaria, Ireland, Italy, Cyprus, Portugal and Slovenia received recommendations in this direction this year. A number of member states are exhibiting problems with the efficiency of the judiciary and corruption. These problems hamper investment and economic development in general. The Commission has identified the following issues: fragmented frameworks for the prevention of corruption and inadequate control mechanisms; discrepancies in the anti-corruption legal framework and law enforcement; insufficient prosecution of high-level corruption; informal payments in healthcare; lack of competition and transparency of public procurement. The European Central Bank has called for the removal of the rose-coloured glasses that European Semester 2017 is viewed with. 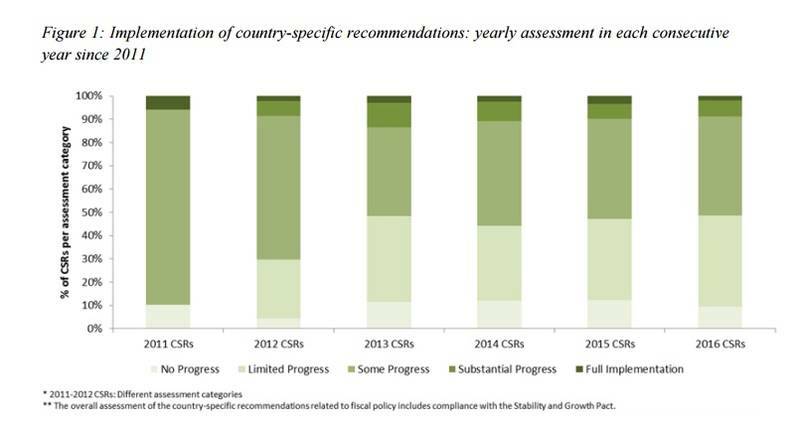 In its analysis, the Bank points out that, despite the enhanced monitoring, the implementation of the recommendations in countries with excessive imbalances does not increase. Weak performance is worrying to the ECB as it means that the vulnerability of some member states in the euro area and their problems remain. Moreover, vulnerability continues to be observed in countries with excessive imbalances – Bulgaria, France, Croatia, Italy, Cyprus, and Portugal. The bigger problem for the bank is that not only does the implementation of the recommendations remain low, but the Commission is constantly reducing them. In some cases, the EC has even removed recommendations that were poorly implemented in previous years. 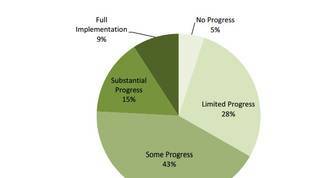 Moreover, lately there is even no deadline set for implementation. The ECB is disappointed to note that less or no recommendations are being made to improve product markets and framework conditions. “This is surprising since a lack of competition in product markets and sub-optimal conditions for business activity remain an issue in many sectors across member states. In view of the continued emphasis on strengthening private investment and productivity, it will be important to ensure that greater focus is restored to product market reforms in member states’ CSRs”, the ECB’s analysis notes. The bank proposes that, in order to overcome difficulties in reforms implementation, all countries with excessive imbalances that are in the preventive arm of the macroeconomic imbalances procedure should be transferred to the corrective one, where there is a possibility to impose sanctions for non-compliance. However, it is unlikely that support will be found among member states for this. At the June European Council, country leaders were visibly pleased with this year’s European Semester. Without discussing the substance of the concrete recommendations, they shared their satisfaction with the good economic performance presented to them personally by ECB President Mario Draghi. European Council President Donald Tusk (EPP, Poland) even said that thanks to this, there is already a new hope for the future of the European project. “I wanted to share with you this optimistic assessment of President Draghi, because it’s the first time in many years that we have heard such good news“, said the former Polish prime minister. And Commission President Jean-Claude Juncker (Luxembourg, EPP) was even insulted that no one is paying attention to this incredible economic success. “We had good news coming from all the quarters of the EU, unemployment is going down, the employment rate is improving – we have 232 million of Europeans in employment. That’s the highest employment rate we ever had in the EU. Growth is picking up, distributed in an unequal way but nevertheless showing new colours. The fiscal deficit is in fact decreasing. Nobody is saying this. In 2011, we had 24 countries in the excessive deficit procedure. We are left now with 4. And this is a tremendous achievement and nobody is referring to that”, Juncker scalded journalists at the end of the EU summit. The better economic situation, but also the Brexit problems, have led to a significant increase in European citizens’ support for the EU. According to the spring Eurobarometer survey, published in early August, confidence in the EU has increased by 10 points since the autumn of 2015. Currently, 42% trust the EU, 37% trust their national governments, and 36% their national parliaments. However, there is hope that the conversation about improving the implementation of the European Semester recommendations could be held this fall when serious discussions are to be held on the European Commission’s series of reflection papers on the future of the Union. In many of the scenarios for the future, the Commission envisages strengthening the European Semester and making a stronger connection between it and receiving EU funds. The ECB is also likely to set a new tone in September when there are expectations for a major change in the bank’s monetary policy. This is what its president, Mario Draghi, could hint at in his statement at the annual economic seminar of the Federal Reserve in Jackson Hole this weekend. Jordan BDS, today, announced that seven private and public companies have discontinued their service contracts with G4S, the security company. This announcement comes in response to a global boycott call against G4S’ parent company for its complicity in Nazi regime of occupation and settler-colonialism. For 40 weeks now, Israelis have been demonstrating in the city of Petach Tikvah to demand a thorough investigation into corruption, especially concerning the prime minister, Binyamin Netanyahu. The protests started in earnest in July 2016 outside the home of the attorney-general, Avichai Mandelblit. At that time, they consisted of a handful of protesters demanding that he does a better job than his predecessor, Yehuda Weinstein, especially in regard to attorney Ruth David, who has been accused of a number of crimes. Since then, matters have developed and taken a different turn. A few weeks ago, Manny Naftali, a former employee of the Netanyahu household who had become a whistleblower, joined one of the anti-corruption protests and was brutally attacked by the police, who broke his arm. He wasn’t the first. Many other protesters have been hurt, week after week, in unprovoked attacks by the police. Since Mr Naftali won a case against the Netanyahu family for abuse, he has suffered many threats and false claims. Meanwhile, the anti-corruption protesters have grown from a few hundred to many thousands. They have also become politicised, focusing more on Netanyahu than the deep-rooted corruption in all aspects of Israeli public life. As a result, and completely illegally, last week the police decided that all protests in Petach Tikvah would be deemed illegal. The city is now under siege, with police officers at every corner. Two activists were arrested – Eldad Yaniv and – yet again – Manny Naftali, in separate incidents on their way to the city. They were held in detention for refusing to pay a penalty and accepting a restraining order. Thousands gathered outside the police station to demand their immediate release. After they were released, a legal bid was made to continue the lawful protests. The judge could not decide, even at the Supreme Court, and made an interim decision that only 500 people would be allowed into the city to protest. On 26 August the police set up roadblocks, stopping cars, noting the drivers’ identity card numbers and asking them about their intentions. While protests were also taking part in 16 other cities across Israel, the protesters worked their way around the decision to restrict their numbers by standing in a different spot to the usual place in which they had congregated. Medina mishtara (Hebrew for police state) rang through the air as protesters chanted over and over again. Their focus was on just one issue: the right to democratic protest and free speech. There is little mention of the weekly protests in mainstream Israeli or international media. However, the list of public officials and ministers under investigation for corruption is growing, and it is possible that another social protest similar to that of 2011 is brewing. Since then, nothing has improved – not only are prices higher than ever as the OECD recently reported, but corruption is now overt and out of control, as many protesters will testify. Freedom of speech is at risk. On 30 August a Supreme Court judge will decide if the democratic right to freedom of speech will be upheld in Israel. But the question must be this: why should this have to reach the Supreme Court at all? And are the supporters of Israel even aware of the fight for democracy and civil and human rights? Or are they wallowing in blissful ignorance, believing that all is well in the Garden of Eden?